This comes in a line of posts which could be placed into the general category of: “Don’t think you can behave like an absolute plank on social media and then remove all trace of what you’ve done”. Social media is terrible at keeping secrets, and when it comes to username changes on Twitter, that couldn’t be more true. 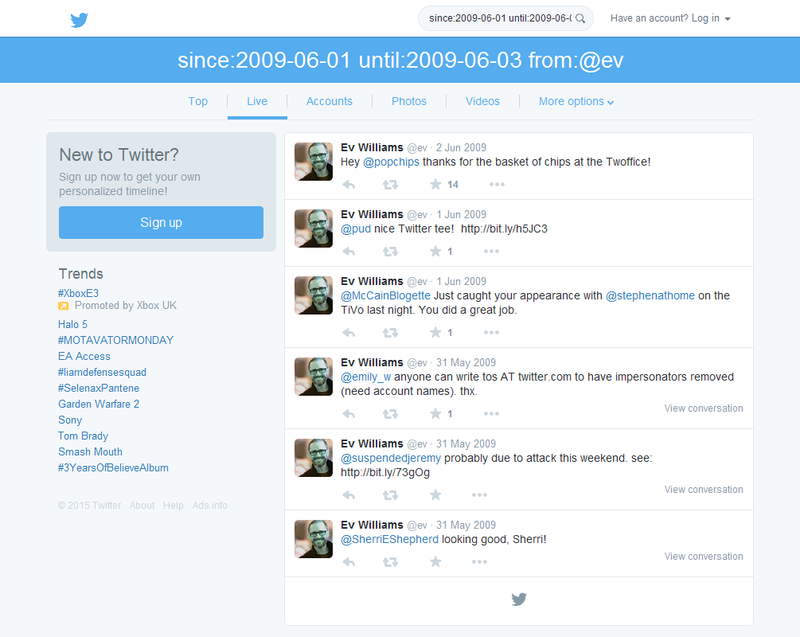 Even after Twitter accounts have been deleted and are long gone, it’s still often possible to track their username progressions, and establish an overview of what the users were up to. It’s admittedly more difficult with deleted accounts, but it’s straightforward with currently active, public accounts. The bad news is that if you were expecting some sort of one-click app that rounds up old Twitter usernames on the spot, you’re going to be disappointed. This takes varying degrees of detective work, and there is a learning curve. Whether you want to learn the process really depends on how much you want the information. But if you do decide to read this guide, you’ll learn a lot about digging deep into Twitter for obscure info, and gain a fantastic insight into how vulnerable we all are to being monitored – even retrospectively. So, square one. There’s a user on Twitter. You need to keep an eye on them and they’re always changing their username. They’ve blocked you, so you can’t just follow them (and you may not want to follow them anyway). How do you track them?… You bookmark their account’s unique ID. This is obviously orientated towards the future. It won’t enable you to trace past username changes (that’s coming up next), but it will enable you to find the account if the username changes in future. This is worth doing for any user you think is up to something dodgy. Now open another tab, go to http://tweeterid.com/ or a similar Twitter user ID translator app, and enter your chosen user’s current username. The URL in your address bar is now complete, so you can hit enter. When you do, the user’s Twitter will come up on screen. You can see how it’ll look if you click the active link above. Once the user’s page appears, bookmark it, and you’re done. 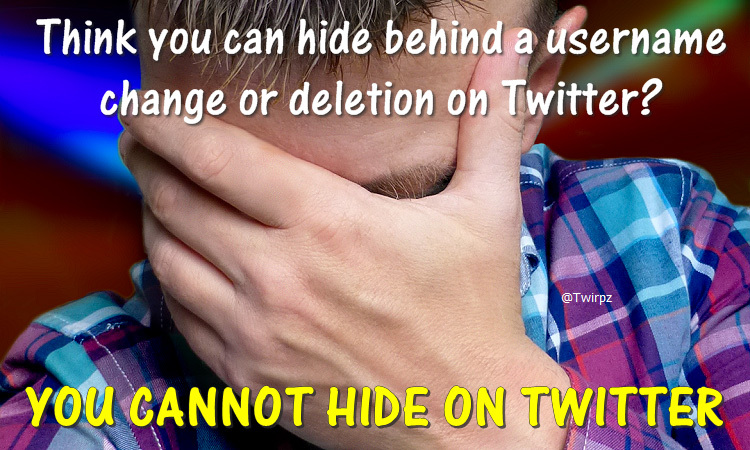 No matter what the user does with that account now, as long as it exists on Twitter you can instantly find it. So, that’s how to take care of the future, but you may be more interested in looking into the past. Let’s get started on that. When you search for a username on Twitter, the site will potentially show you all tweets made by the account that currently bears that username. The problem is that all the results will display as if they’d been posted under the current username. That means you can’t see previous usernames, and therefore you can’t search the replies or mentions for any previous usernames you don’t already know. If you’re reading this post, you’ll probably be only too aware that when people get up to no good on Twitter and get caught out, they very often change their username for this exact reason. Scammers, catfish and the like, know that people will search their replies and mentions for evidence of their transgressions. They change their usernames precisely because they want to hide all the complaints they’ve had in the past. But if the account is currently active and public, and the user has not deleted their old tweets, username changes can be tracked through conversation reversal. Conversation reversal, at its most basic, is simply finding an old conversational tweet made by your chosen user, and clicking to view the conversation. The old username will be contained in tweets forming the other side of that conversation. My tweets show up with the @PlanetBotch usename, but tweets sent TO me show up as addressed to my old username of @HolyCodpiece. So now you can search the replies to @HolyCodpiece, as well as @PlanetBotch, to make sure I wasn’t up to no good. Okay, so that’s the simple overview. But how do you find out when a username change took place, so that you know which old conversation to click? You don’t want to be scrolling through miles of tweets randomly clicking here and there, do you?… No. So let’s go through a full tutorial, by example. You must keep the date format the same when doing any of these searches: Year-Month-Day, four digits for the year and two digits each for the month and day. until: is Twitter’s standard command for “anything before this date”. since: does the opposite, returning “anything after this date”, and we’ll be using that later. to: is the command for “replies sent to this user”. It doesn’t return mentions – only replies. from: returns any tweets sent BY the @username you enter, and again, it’s not in the above line but we’ll be using it later. In most circumstances the More Options > Tweets step will pull out even the most obscure communications. So, after doing that first search, are you seeing tweets? Yes. If you click to view the conversations, do you see my current account? Yes. 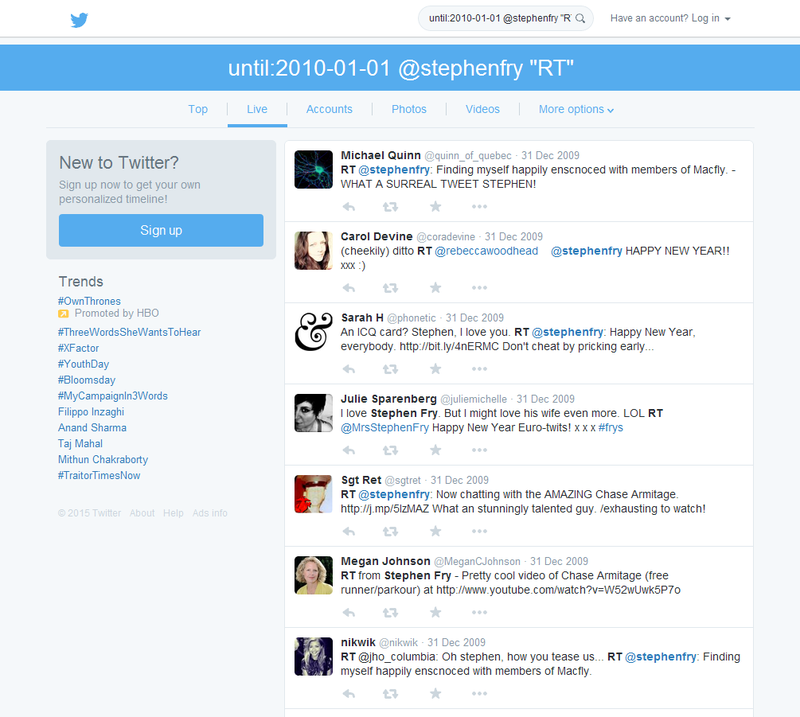 It’s therefore clear that I was using the same username prior to the cutoff date in the search – 1st January 2015. 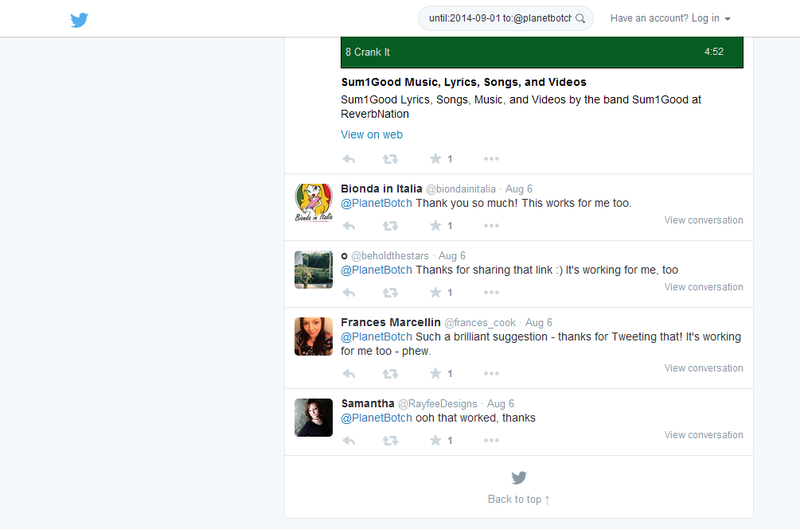 That sets the search date range to before 6th August 2014, but this time searches for tweets FROM me rather than TO me. Logically, because there are no replies to @PlanetBotch before the date in question, any replies I get BEFORE that will show my previous username. So once you’ve entered the above search, all you need do is scroll down to the first indication of a conversation, click to view it, and boom – you have my old username. Deep in the Twitter underground, Twitter’s test accounts are a fascinating find. If someone has used lots of usernames, you can keep repeating the process, setting your date range further and further back in time until you’ve collected them all. You can use the since: and until: commands in the same search to isolate exact periods of time. It can take a while to collect lots of usernames, but as long as the user doesn’t delete their old tweets, and has conversations (and you probably wouldn’t be interested in them if they didn’t have conversations, so I’m sure they do), it should all be there. With older conversations, there won’t be any connectivity on Twitter between the different components of the dialogue. Originally, there was no such thing as an @reply or @mention, and for a long time after the function was introduced, the site did not formally link a reply to a ‘parent tweet’. In fact, nothing prior to 6th July 2012 will link together the dialogue components. So with any conversation prior to that you’re going to have to add an extra step. This is where things get more complicated. since:(the day before the date of the conversation tweet) until:(the day after the date of the conversation tweet) from:@(the username of the person mentioned in the conversation tweet). It’s now a matter of working out which one of those users, if any, is your name-change account. You may need to repeat this a few times to get a conclusive result, and you may also find it better to widen the date range by a day or two in case the conversation was not concluded in a single day. In the above situation, the previous username may show in plain text rather than as a link, and that will help you find it. However, this is not necessarily the case. 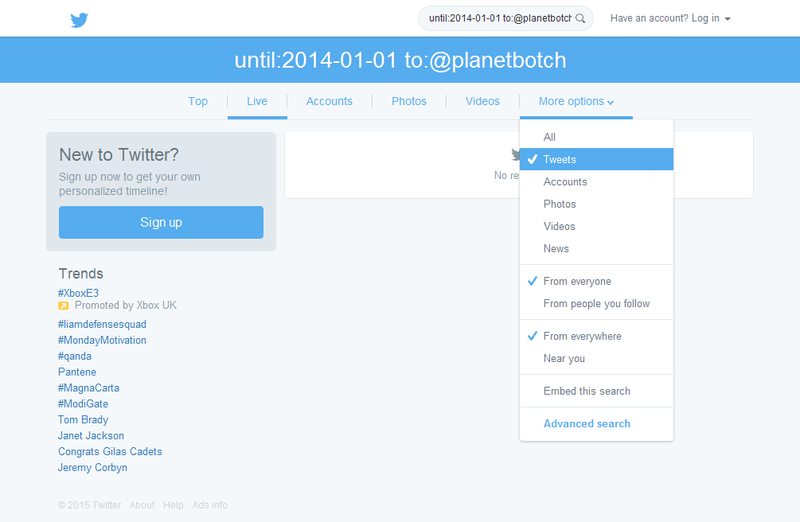 How it works is: if the previous username no longer exists on Twitter, it’ll drop its link and show in plain text, like this: @PlanetBotch. However, if the previous username has since been adopted by someone else, and therefore does once again exist on Twitter (but attached to a different account), then it’ll still show as a link, like this: @PlanetBotch. With any situation in which you can no longer see the tweets of your target user, things become a lot more difficult. You can’t reverse a conversation when the key part of it is missing. However, most of the replies to a protected/deleted user will almost always still exist and be visible. So you can still establish the earliest reply to the known username, using the technique we employed before. You’ll therefore know roughly when the username was changed, and that’s important. Now you have a real detective task on your hands. But it’s not impossible. The factor that most often reveals the old username in this situation is ‘associate continuity’. Even though they may change their usernames, users continue to communicate (or argue) with the same people – or at least some of the same people. Try to single out a user who was replying regularly to your target account just after a username change, then select a date range for the period just before the username change, and search for tweets FROM the replying account. I’ve unearthed loads of old usernames with this trick. Indeed it works the majority of the time for me – even when the target account is protected or completely deleted. You can never 100% prove that any username you find actually was the same person, but it’s often blatantly obvious when you do find the previous username. Typically it will have some similarity to the current username, and you may be able to check and cross-reference the user’s behaviour once you have their old username to search. SO IS THERE ANY WAY I CAN ACTUALLY SEE PREVIOUS TWEETS FROM THE DELETED/PROTECTED USER – TO VERIFY IT’S THEM? Particularly if you’re going back a fair distance in time, this could give you more than you expected. When retweeting, people would, and to an extent still will, copy and paste a user’s tweet rather than actually clicking the Retweet button – then add the letters RT into the tweet to show it was a retweet. Going back to the early days of Twitter, this was the standard retweet option, as the Retweet button didn’t exist until almost the end of 2009. So for anything prior to around 20th November of that year, ALL retweets should contain the letters RT and, importantly, they’ll survive the deletion of the source account. Therefore, even though an account is gone, or the user has since protected, deleted their tweets or whatever else, the “RT” Search Trick may well give you a good picture of some tweets that a user posted under an old username. How many you’ll find depends on how influential the user was, and sometimes you won’t find anything, but it’s worth a try. The simple search commands we’ve looked at in this piece will enable you to pull out a ridiculous amount of information from Twitter, which most people thought was gone for good. You have to use your brain, and think like a detective, but the tools are there. There’s very, very little that actually matters on Twitter, which doesn’t leave at least some permanent trace. So if you care enough about someone to look for their old username, chances are they’ll have left enough of an impact for you to trace it. Happy searching.